The Urban Politico: Come on Ron - Not Again! Metta World Peace is up to no good and has struck again, but was it intentional? I try to root for Metta World Peace (Ron) and cheer him on as much as I can. However sometimes he makes me scratch my head. He is clearly in a very fortunate position to be playing for the Los Angeles Lakers, considering the house cleaning exercise we recently saw. **Cough, Cough - Lamar Odom** Honestly, I have not been following Ron and am not sure what to make of the recent ruckus, that he has caused. Before we delve into the issue at hand. Let's take a look at this video of Metta World Peace (Ron) in 2010 when he showed so much promise of a young man who had cleansed his soul, fought back against adversity and seemed like such a changed man. Yes, I know he said F$%K on national television, but we all felt where he was coming from and could see that his therapist had been very instrumental in his growth. 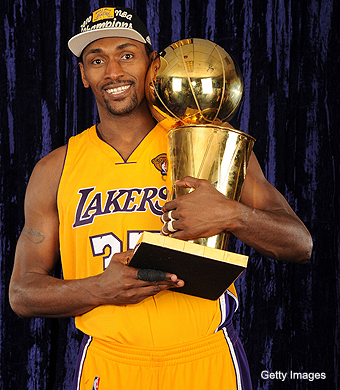 Now let's take a look at what Metta World Peace (Ron) did Sunday evening. Was this an intentional elbowing or was Metta World Peace (Ron) caught up in the moment of his chest pump? If this was intentional, what should be Metta World Peace's (Ron) punishment?